You’ll have two options to rent; cabins or tent/campsites. Include 4 single bunks, heater/A.C., refrigerator, microwave, and sink. These cost $75.00 per night w/ a 2 night minimum. We need a definite yes for numbers to reserve a cabin(s). These do not require a reservation, are first come first serve and cost $25.00 per night w/ electrical hookup. Total cost will be divided by number of participants. We need a definite yes for numbers to reserve a cabin(s). Every Guy is welcome to come out and enjoy the fellowship! 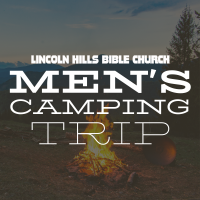 This camping trip is a BYOBFCG (bring your own beverage, food, and camping gear.) We will have a community fire going as often as possible.